A 16-step Performer module, with two crossfading modulation sequences. Is Native Instrument's new stand-alone soft synth as big as they say it is? Native Instruments have been one of the most prolific music software developers in recent times, but even by their own standards they've been particularly busy lately. In order to catch up with them, we're going to look at not only their brand-new stand-alone synth, Massive, but also at the lastest versions of Absynth and the sucessor to FM7, FM8 — and we'll take a quick look at Kore v1.1 and the contents of Komplete 4. Attack Of The 50-foot Synth! 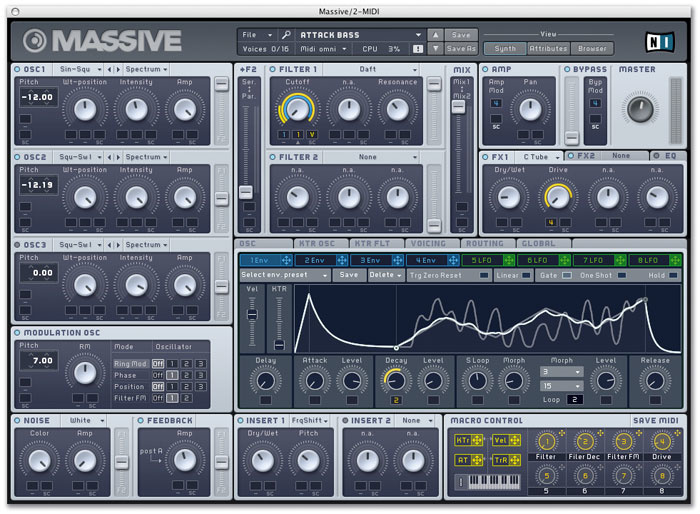 Massive is a semi-modular wavetable synthesizer with lots of routing flexibility and a wealth of modulation and control options. Wavetable synthesis is seeing a resurgence in popularity lately, and Massive 's oscillators are some of the best implementations of the concept I've seen. 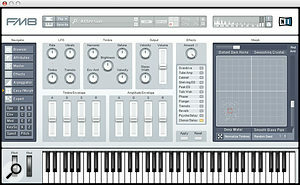 However, the sound generation technique is not the main area where the synth aims to break new ground. 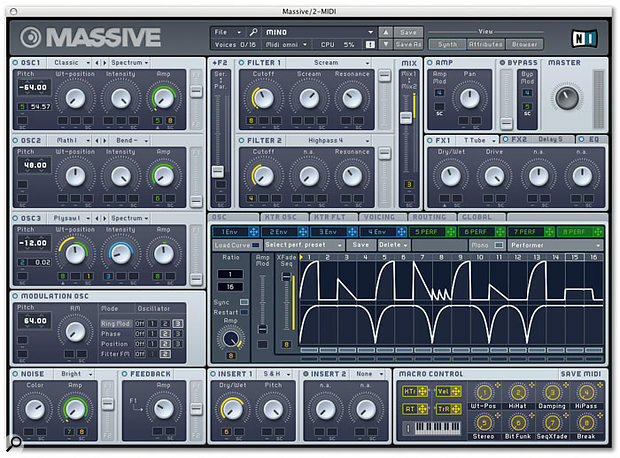 Firstly, Massive has been designed to pack an unusually large number of highly versatile modulators into a fast and understandable user interface. But where Massive really aims to plant its flag is on the high-ground of sound quality. When I visited Native's headquarters in August, Massive 's Product Manager told us that their top priority was to take a leap in sonic quality, even if this meant pushing even recent computers to their limits. The result is a synth that really does reach unprecedented heights in sound quality for a virtual instrument, but gives your computer a thorough workout getting there. A wavetable is a 'stack' of sampled single-cycle waveforms that a synth can read from and use as its oscillator shapes. For example, you might have a simple wavetable that consisted of a sine wave and a sawtooth wave. You could then select whether the oscillator played a sine or a square. A wavetable with many waveforms to choose from gives you lots of sonic starting points to play with. More interestingly, though, if you can modulate the wave selection control, you can create sounds that change over time. If the waveforms in a wavetable are arranged so that they change incrementally from one to the next, you can scan through the table and create smoothly evolving sounds. The wavetable list gives Massive's oscillators a large number of sonic starting points.Each of Massive 's three main oscillators has over 80 wavetables to choose from, divided into four categories (see the screen below). The first few tables provide the familiar saws, squares, triangles and sine waves, but there is a practically unlimited supply of raw materials in the tables, from familiar organ or synth sounds to weird and wonderful digital waves. Of course, what's really of interest is how the tables sounds when the oscillator scans through them. Nearly all Massive 's tables provide a smoothly morphing sound when scanned. Like the classic PPG Wave synths, most of the sounds are 'synthy', while a few (such as Guitar Pulse) can be used to model real instrument sounds. Each oscillator's Position knob sets a starting point in the wavetable, which, without further modulation, will simply produce a static waveform from the oscillator. An Intensity knob further shapes the basic sound in various ways determined by the mode selected in the menu above it. In the default Spectrum mode, the knob determines how many harmonics are included in the sound, so has a similar effect to a low-pass filter. There are then three Bend modes, which modulate the speed at which the wave plays back over the length of each cycle. Depending on the wavetable, this sounds like a subtle FM or pulse-width modulation. Finally, Formant mode gives results somewhere between a formant filter and oscillator sync. In addition to the three main oscillators there's a noise generator and a Modulation Oscillator. The latter is not an LFO, as you might think, but a sine-wave oscillator running at audible frequencies. Instead of being added to the mix, this can be used to modulate the other oscillators and the filters. In some synths you can cross-modulate the main oscillators to create FM or ring-modulation-style effects. Massive doesn't have this provision, instead opting to use this extra oscillator. The Mod Osc is routed via a small matrix (as in the screen below). Any of the main oscillators can be ring modulated, phase modulated (which is effectively the same as FM in Massive) and/or have its wavetable position modulated, all by different amounts. This final choice can give the sound a raspy edge, and is good for simulating bow scrapes. The Mod Oscillator's pitch tracks the keyboard, so its results can easily be tuned to become a harmonic constituent of the sound. A separate high-frequency oscillator can further shape the sound of the main oscillators and filters.Before moving on to look at the routing and filters, we'll take our first trip into Massive 's Center Window. No less than 14 pages are accessed from this section, via two rows of tabs comprising six General Pages and eight Modulation Pages. The Voicing page is home to, among other things, the voice count and Unison settings. Managing the number of simultaneous voices is an important issue with a synth as CPU hungry as Massive. Having said that, one of my favourite features is Unison, which shamelessly eats up multiple voices per note. Unison has a unique three-way action, allowing you to spread voices by pitch, pan position and wavetable position. The results are, well, massive, but you'd better limit the Unison voices to three or your computer will choke pretty quickly. 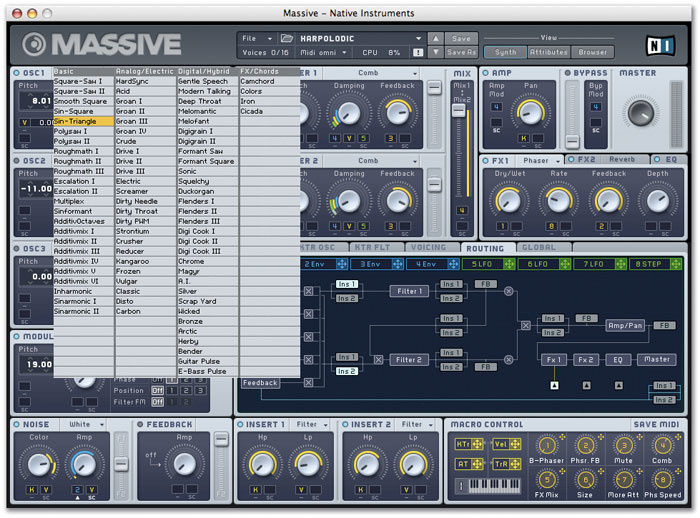 Massive is a semi-modular instrument, so there's a default signal flow between its sections which can be altered in various ways. Two different routing methods are employed: an interactive flow diagram (as shown in the top screen on the next page), and crossfaders that set the levels of signals going to various destinations. Each oscillator has a crossfader that determines the level going to the two filters. There is then a fader that sets whether the filters are routed serially or in parallel, or something in between, and then there is a filter output crossfader that determines how the filters are routed to the Amp section. For example, if you wanted to create a classic serial dual-filter architecture, you would set the oscillator faders to go to Filter 1 only, set the filter routing fader fully to serial, then set the filter output mix to Filter 2 only. The real beauty of this system, however, is that you don't have to fix anything one way or another, and can experiment to find the best blend. Even better, you can apply modulation and envelopes to any of these faders so that sounds morph between different routings. The default module order and routing can be varied in the Routing page.The filter modules can be switched between various modes, including two- and four-pole low pass and high pass, all pass, band pass, double notch, band reject, Scream, Daft, and comb. In addition to the usual frequency and resonance controls, some modes have an additional parameter. For example, the Scream filter has a Scream control that sets the frequency of driven resonant feedback. The other 'signature' mode, Daft, is the best for warm, low-end enhanced analogue sounds. The rest of the standard filter types are very smooth and quite transparent at normal levels, and the fundamental frequencies drop in level as you push up the resonance, keeping the overall level equal. At first I was a little disappointed at this polite behaviour, and at the lack of saturation controls to add some dirt and warmth. However, I soon learned that the filters are designed to respond to the input level in an analogue way, so if you drive them hard you are rewarded with nice, smooth, compressed saturation. This is where the Feedback module comes into play. Clicking any of the small 'FB' blocks in the Routing diagram selects it as the point to route a portion of the signal back into the filters. The Feedback knob sets the level of this signal, and immediately starts driving the filter inputs, giving you anything from a subtle warmth to complete overload. If it's total sonic destruction you're after, or if you want some other ways to shape the sound, two insert effects can be slotted into the signal path at any of the points labelled in the Routing page. The shaping stages can occur before, after, or in between the filters, and at various stages with respect to the feedback loop. The insert effects include additional filters, sample and hold, a bit crusher, and sine and parabolic shapers. My favourite is the Frequency Shifter, which lets you blend in a pitch-shifted version of the main signal. By including an insert effect in the feedback loop, you can aggressively mangle the original sound. The final routing option is to set a Bypass Chain. Any of the main oscillators or the noise generator can be split off and fed directly to the master effects section, the last stage in Massive 's signal flow. The Bypass fader can then be used to mix this into the final output, allowing you to create sounds that blend both filtered and shaped sounds with pure sources. The life of a Native Instruments user has often been one with more than its fair share of admin and regular updating. NI have now decided to try to simplify things by make all major updates and new Komplete versions an annual Autumn event. Komplete 4 bundles most of NI's core products (see the list), with the exception of Massive. As with previous incarnations, Komplete 4 gives you a huge amount of bang for your Euro. 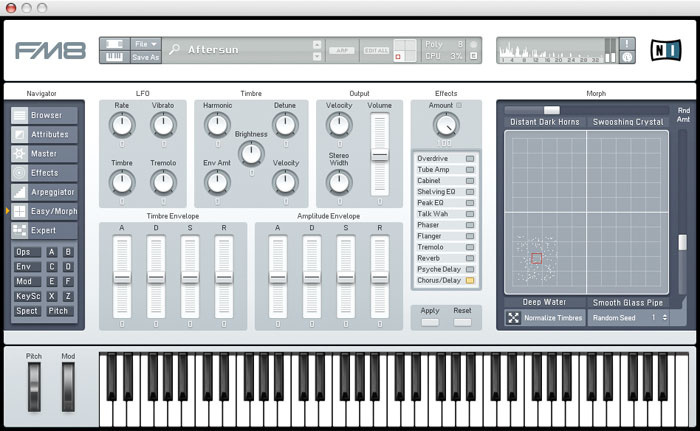 The Kore-style Sound Browser is now a standard feature of NI's Synth Line instruments. Several products in the Komplete line-up have received an overhaul; chief among those not mentioned elsewhere in this article is Battery. Version 3 features a graphical make-over and now allows you to edit the cell matrix that is the core of its operation. Perhaps the most useful new feature is the ability to import loops in the REX, Apple Loop, Acid and Beat Creator formats. Kore has clearly been an influence across the NI product rang, and, among other things, introduced the concept of searching for patches by sonic attributes, which materialised in the form of the Sound Browser. The Browser lets you display and sort sounds either as a standard list or, more importantly, by filtering the pool using attribute keywords, such as 'Synth', 'Warm' and 'Pad'. This Browser is now a central part of all the new plug-ins, with the exception of Battery 3. The only difference between Kore's Browser and the Browser in the plug-ins themselves is that the latter can only search and display sounds for that particular instrument. The unified preset management system is a great improvement in Absynth 4 and FM8, which previously had banks of sounds that had to be loaded from files. Both plug-ins now enjoy instant access to huge libraries consisting of new presets and the consolidated banks from previous versions. It's obviously much more convenient to be able to list all your pads, for example, instead of having to wade through various banks trying to find the right sounds. 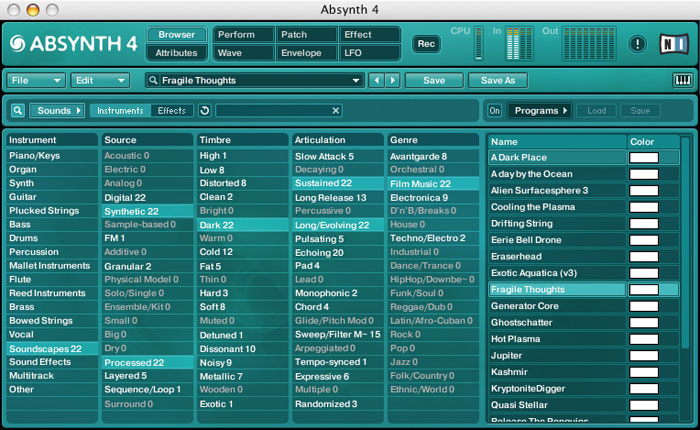 In addition to the standard Browser, Massive, Absynth 4 and FM8 all have a Program List view, where you can drop any sounds from the library. Patches in the list can be recalled via MIDI Program Change messages. With the arrival of Kore 1.1 (after an awkward few weeks when the supposedly 'Kore Ready' new synths had incompatible libraries) the sound system has received an overhaul that unifies all NI sounds into a single library directory. A new subclass of the .ksd file format has been created, called a Singlesound. This is a standard patch for one of the plug-ins and can be opened by both the plug-in and Kore. In Kore, opening a Singlesound inserts the parent plug-in, which is displayed as a simple, thin rack device. You can make changes to the sound, and save it, and the patch can still be read by the plug-in on its own. However, an 'Extend Sound' button lets you turn the patch into a full Kore patch, complete with its own internal mixer. If you save a version of this patch, it will no longer be readable by the plug-in directly. As well as unifying the sound library, Kore 1.1 also saw the welcome return of MIDI Sync input, a new and quick way of merging sounds in Kore patches, and the ability to preview patches in place from the sound library. The biggest news was that NI have responded to the popular request to allow Kore to run when the hardware controller is not attached. I happily got one of my top wishes, and you can now move knobs on the controller without a big value display obscuring the rest of the settings. Many of the controller mapping presets have been updated, and many third party plug-ins are now supported. Bewilderingly, though, despite NI having added eight Macros to Massive, they've mapped them across two Easy Access pages. There's still a long way to go to reach its potential, but Kore is making progress. You may have noticed that none of the modules has any dedicated envelope or modulation controls, only small fields under each knob. These squares are the modulation 'slots' where Massive 's numerous envelopes, LFOs, step sequencers and controllers are assigned to parameters. The blue '4' in the Amp Mod slot indicates that modulation source four is being used to create an amplitude envelope. This is the only default modulation mapping on blank Massive sounds. If you need a filter envelope, you must assign one of the other three envelopes to one or both of the filter frequency controls. This is done by clicking the four-way arrow icon next to the envelope of your choice, and dragging it into the relevant slot. The mod amount is set by clicking in the assignment slot and dragging the mouse up or down. A coloured ring is drawn around the knob, starting at the current position and showing the exact range and direction over which the envelope affects the parameter. LFOs (modulation sources 5-8) are assigned in exactly the same way, but are distinguished from the envelopes by colour-coding (envelopes are blue, LFOs green). Manual control assignments appear in yellow, and include both playing characteristics (velocity, aftertouch) and eight 'Macros'. Macros are now a NI standard in the post-Kore climate, allowing hands-on control of the significant parameters of a sound when playing. Infuriatingly, though, the default Massive template in Kore splits the Macros over two pages. Surely everyone would expect the Kore hardware controller's knobs to map straight to the eight Macros? Any modulation sources can be assigned to control parameters directly, or set to scale the depth of another modulator. For example, you could assign a Macro to alter the filter envelope depth. This is done by dropping the desired control into the rightmost assignment slot of the parameter, then clicking the 'SC' label to declare it a side-chain. The small arrows under the other slots are used to choose which assignments are affected by the side-chain. Keyboard Tracking is included in the Macro section, although there are dedicated pages in the centre section for editing the keyboard tracking for pitch and filter frequency, both of which are hard-wired and don't need mapping with assignment slots. Similarly, there are dedicated velocity and tracking settings for each of the envelopes. Strangely, there is no dedicated mod wheel source available in the Macro section. If you want to make a mod wheel assignment you need to use a Macro knob, which can then be mapped to your mod wheel via MIDI. An unusual inclusion is the Random Track mod source, which generates a random value each time a MIDI key is pressed. This is probably the least dramatic of all the NI upgrades, but there's still quite a lot in Absynth 4 to keep devotees happy. For me, the biggest improvement is the graphical overhaul. The graphics are sharper and brighter, and the plug-in window is larger, making all the modules less fiddly to use. The Envelope window can even be resized like a normal window, meaning that you'll spend less time hunting around with scroll bars. The Effects page has benefited from the make-over and now sports graphical controls instead of a list of numbers. As Absynth now employs the standardised Sound Browser, the old Main view is gone. Replacing it is the multi-tabbed Perform page, which defaults to showing global parameters, 12 control Macros, a surround panner and the new Master Envelope. This last module is a very welcome addition that scales all the Oscillator Amp envelopes simultaneously, giving you fast control over the amplitude envelope of the whole patch. The results of the Master Envelope's delta values are superimposed on the Osc Amp graphs in the Envelope page. Talking of envelopes, any stage of an envelope can now be declared a 'step', which is displayed as a solid block and makes step-sequencing effects easier to create. A new oscillator mode, Sync Granular, has just two granular synthesis parameters (Density and Scatter) that do some really nice-sounding things with the stock library waveforms (as opposed to samples). It's particularly good at making natural sounds, such as bow scrapes and breath, as well as the eerie, spacious sounds that are Absynth 's speciality. The Wave editor now has a Morphing function, which lets you combine two waveforms in different ways. All the oscillators have access to an extra morph page in the wave selector. The Effects section has an improved Resonator and a cool Surround tool. This displays the the soundfield positions of the effect outputs, which can then be panned and spread in its entirety, and even rotated at a selected rate. There is an entirely new addition called Audio Mod, which allows you to modulate or trigger other parameters based on the level of audio signals at various points in the plug-in's signal flow. The most obvious use for this is to create envelope-following effects, like a Moogerfooger pedal processor, but no doubt it will be put to much more twisted uses! 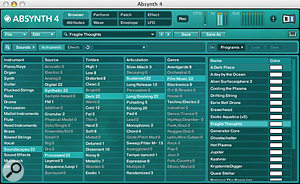 Absynth 4 costs £229 or can be bought as part of the Komplete 4 bundle. Massive has four assignable envelopes, all of which can themselves be modulated at various stages by each other, or by LFOs, and so on. These are just about the most flexible, programmable envelopes you could dream up. However, unlike Absynth 's multi-stage envelopes, that are drawn by hand using breakpoints, these take a much more useable approach. The envelopes loosely follow the tried and trusted ADSR formula, but with a large degree of precise control and a multi-shape looping stage. The Loop stage defaults to off, and the Decay acts like a traditional Decay and Sustain combined. The Attack stage has a very welcome level control, making it possible to create smooth curves into the Decay stage, as well as traditional peaks. However, it's the Loop stage that is the most innovative. Set the number of loops from one to infinity, and the stage kicks in. The 'S Loop' knob sets the duration of the loop, while 'Level' sets the difference in level between the beginning and end of the loop. The shape of the loop is set using the Morph controls. Two pop-up lists offer 22 preset shapes, some of which are single curves, some are like LFOs, and some are just plain nuts. Two shapes are active at any one time, and the Morph knob fades the actual loop shape between the two. In the screen shot above, you can see how the grey lines show the preset shapes, while the white line shows the actual resultant curve. Massive's versatile envelope designer.The other four modulation sources in the Center Window are LFOs. You won't be surprised to learn that there's a lot more to them than regular LFOs, and, what's more, each one can be swapped for a 'Performer' or a 'Stepper', both of which are 16-stage curve or step sequencers. Each LFO modulator actually has two shapes, with a crossfader for morphing between the two. I really like this feature; if you want an LFO that's in between a triangle and a sine wave, you just make one. As well as the four basic shapes, there are about 30 more to choose from, and you can adjust the phase of each just by dragging the graph. An LFO's speed, blend and global depth controls can all be modulated, and in addition to all the regular mod sources each LFO has its own simple AD envelope that can be assigned to its own controls. This is a prime example of the wealth of features that you become happily accustomed to when programming sounds in Massive. The only addition I found myself hoping for was a display that showed the final LFO shape, in the same way that you see the final loop shape in the envelopes. The Stepper and Performer are similar concepts, but useful in slightly different ways. The Stepper is a 16-step sequencer, which can be applied to any modulation destination. Applied to oscillator pitch it creates melodic sequences. Although it can have similar results, this is not true arpeggiation, as it's applied on a per-voice basis, and is not actually re-triggering new notes. I'm surprised there isn't an arpeggiator built into Massive (as there is, for example, in FM8). Like the Stepper, the Performer plays a loop of up to 16 modulation stages, but instead of static values, each step is a curve (as in the screen on the first page). Each step can behave like a simple envelope, or you can build up bigger curves covering several steps. Sixteen shapes are available for dropping into any of the stages. Similar to the LFO page, each Performer can contain two separate sequences that you can morph between. Both the Stepper and Performer provide a huge amount of scope for sound design, allowing for evolving, pulsing or strongly rhythmic sounds, as well as complex loops. A number of the factory presets showcase these features by combining multitrack looped drums and melodies in one patch. If all this is not enough for you, the final output section offers two master effects slots and a final-stage EQ. The effects include delays and reverbs, as well as the expected choruses, flangers and phasers. I was pleased to see that the chorus comes in mono as well as stereo versions, giving you a less CPU-hungry method of thickening the sound than the true unison. Similarly, the Dimension Expander spreads the sound into stereo with some subtle chorus and reflections. Finally there are three tube-emulation effects for adding a bit of warmth or distortion. Surprisingly, there are no compressors in the master effects or the inserts. Given how feature-rich the rest of the instrument is, I'm inclined to think this is by design rather than an omission. The filters have to compress pretty hard to deal with the internal feedback routing, but I'd still like to see some final-stage compression. Of all the upgraded plug-ins that come with this year's Komplete upgrade, FM8 has had the biggest change, to the point, in fact, where it's practically a new instrument compared to FM7. The graphical face-lift changes the entire plug-in to white, and everything has moved around to make it an easier instrument to use and program. Like Absynth 4, the inclusion of the Sound Browser sees the end of the old standard front panel. You'll now spend most of your time either in the Browser or the Easy/Morph page. As with FM7, the Easy page collects certain important controls that influence what is happening 'under the hood', in a similar way to the new Master Envelope controls on Absynth 4. Kore users will find most of these controls on the two standard FM8 Easy Access pages. FM8 allows you to drop four sounds in the X-Y controller and morph between them. Onthe right of the Easy/Morph page is the large X-Y Morph controller, one of the most important new features, and certainly the coolest. Four complete FM8 presets can be stored in each corner of the X-Y panel and morphed between by dragging a marker around. It's important to note that this is not loading four patches and crossfading between them, it's actually moving every parameter between the positions they occupy in each patch. Reaktor users will be familiar with how fantastic and unpredictable this can be with just a two-way morph function. There are different ways of utilising the Morph function. One is to load four random patches, then experiment with morphing until you get an entirely new patch to play with. Alternatively, you can create new sounds that evolve using modulators and envelopes to move the morph position. The X-Y control can also be used as a controller for changing just a few parameters during a performance. For example, you could save different versions of the same patch with the filter and resonance at low and high settings in different corners. One of the nicest ideas is the random factor that can be added to the morph position. By dragging what look like two scroll bars along the x and y axes, you can introduce randomness to the morph position. This is shown as scattered dots spreading out from the central position marker. Within a few minutes of playing with the morph features I created a couple of sounds that were more interesting than anything I ever got out of FM7. Another key enhancement compared to FM7 is a comprehensive effects section. FM7 had only a delay effect, while FM8 has a dedicated effects 'rack' with 12 modules that can be added and used simultaneously. Effects configurations can be stored and recalled, and there's a generous list of preset racks. The other new module gained by FM8 is a powerful and comprehensive arpeggiator, with a 32-step pattern editor and template library. FM8 makes it easier to get your hands dirty and program your own sounds. The Expert pages are all laid out in a more comprehensible fashion, and there's a useful Ops page that displays the FM Matrix along with the key parameters from every operator. It's still a steep learning curve, however, and the morph controller is a much more fun way of generating new sounds. Anyway, the Browser makes a huge number of sounds instantly accessible. FM8 has about 200 new sounds, but the library also includes all the old FM7 presets, and the FM7 Sounds Vols 1 & 2 collections are thrown in too. FM7 sounds loaded into FM8 sound better and clearer than they did before. This is partly due to the new Chorus/Delay effect taking over the job of the old delay. A new High Resolution setting also gives the sound quality a noticeable boost, by using higher internal sample rates at various stages. FM8 costs £229 and is my favourite of the upgrades — it even distracted me from Massive on several occasions. By this point you'll see that Massive earns its name in terms of the scope of its sound generation, routing, and modulation abilities, but what about the sound itself? What we know is that NI decided to prioritise audio quality over CPU efficiency, and run everything at high sample rates. Like MP3s compared to CDs, virtual instruments are usually a compromise, with any corner that can be cut being cut. So how much difference does Massive 's uncompromising approach make? I won't keep you hanging, Massive sounds good. Really good. Just flicking through the presets to the stand-out sounds (the preset library varies a lot in quality) reveals a clarity and depth you just aren't used to hearing from a soft synth. There's a shiny, smooth, dynamic quality to the sound, even the grungy bass sounds, and the oscillators are smooth over a wider pitch range. I did a number of listening tests with Massive alongside FM8 and Absynth 4. To my ears, both these synths sound fantastic. However, when you A/B them in rapid succession with Massive they sound a bit two-dimensional and just a touch grainy in comparison. It's as though the colour and focus of Massive is turned up a notch compared to what you're accustomed to. I also experimented with Massive 's quality settings. By default, Massive runs in Ultra mode, but there are also High and Eco modes, which NI recommend for slower CPUs or when you want to run multiple copies of Massive in a host. Eco mode seems to reduce the CPU load by about 30 to 50 percent. I compared a patch called Cliché Morph (a beautiful, evolving pad with a shimmering metallic layer) at different quality settings. In Eco mode it sounded comparable to Absynth (ie. very nice, thank you). However, switch to Ultra mode, and the sound separates out and becomes spacious, with a kind of 'lacquered' quality. This sound quality, of course, comes at a price: high processing demands. The published system requirements are a 1.4Ghz G4, Pentium or Athlon, but I think this is too low. I tested Massive on a G5 Dual 2.7GHz Mac and a 2GHz Intel Core Duo Macbook Pro, and even these worked up a sweat. On the G5, I usually use Ableton Live with the buffer at 256 samples, but Massive stuttered and refused to play properly. It was perfectly smooth at Live 's default 512-sample buffer, however. In both Live and stand-alone modes most patches reported about 20 to 30 percent CPU usage during normal playing. On the same patches, the Macbook Pro reported about 30 percent higher CPU usage. This was for presets using one to six voices, which is actually enough for most patches as the sounds are so, well, massive. Pads and decaying sounds that use more voices eat further into CPU resources. By default, Massive is limited to 16 voices, and using all at once generally had the processor of my G5 pushing 70 percent. This is pretty high even compared to heavy Reaktor synths. Very roughly speaking, it's about twice as CPU intensive as Absynth 4, or FM8 in high quality mode, and a bit heavier than Arturia's analogue emulations, like the Minimoog V, voice-for-voice. There are bound to be many who find Massive 's CPU hit prohibitive, but I think it makes sense. From what I've seen, the trend is away from multitrack MIDI recording and towards recording and manipulating audio, and also towards simple and less restrictive freeze functions in modern hosts. 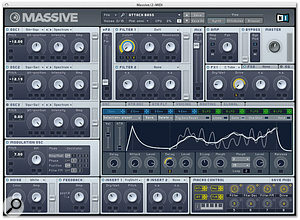 Massive is a soft synth that is going after the big boys of the modern hardware synth world, such as the Access Virus and Nord Lead families. Massive 's aspiration is to be seen in the same light as these synths: a first port of call for solid basses, searing leads, glittering pads and textures, and 'signature sounds', all of which it does very well. However, though capable of it, it is not trying to be an analogue modelling synth in the way these synths are. It has some of the flavour of the Virus, but its kinship is more with the modern-sounding hybrid synths from Reaktor, such as the brilliant Photone. Massive has its own character: descriptions that come to mind are solid, deep, shifting, sometimes glossy, sometimes dirty and chaotic. For me, what makes it 'massive' is that it feels as though you have a huge amount of internal headroom to play with. You can keep winding up the intensity, resonance, ring and phase modulation and the sound just keeps getting richer and denser, instead of breaking up into grunge. Combine the sonic results with a clever and deceptively simple user interface and the hugely customisable envelopes and other modulators, and you get a synth that sets the new benchmark for virtual instruments. Huge sound palette from the wave-scanning oscillators. Cool routing and filter feedback system. Hugely flexible and varied modulation sources. Real-time morphing of filter routings, LFO shapes, Performer sequences, and so on. Simple and visual mod and controller mapping. Quality comes at the expense of high CPU demands. Useable sounds are a bit overwhelmed in the library by the weird and wonderful. Macros inexplicably split across two Kore pages. The new heavyweight in NI's line-up is a distinctive and finely crafted synth in all respects: concept, audio engine and user interface. 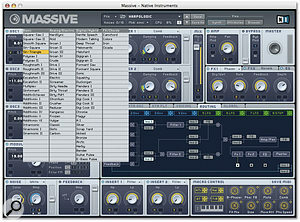 Massive harnesses the raw power of modern computers to achieve hardware-quality sound. This is the synth your sequencer's freeze function has been waiting for.